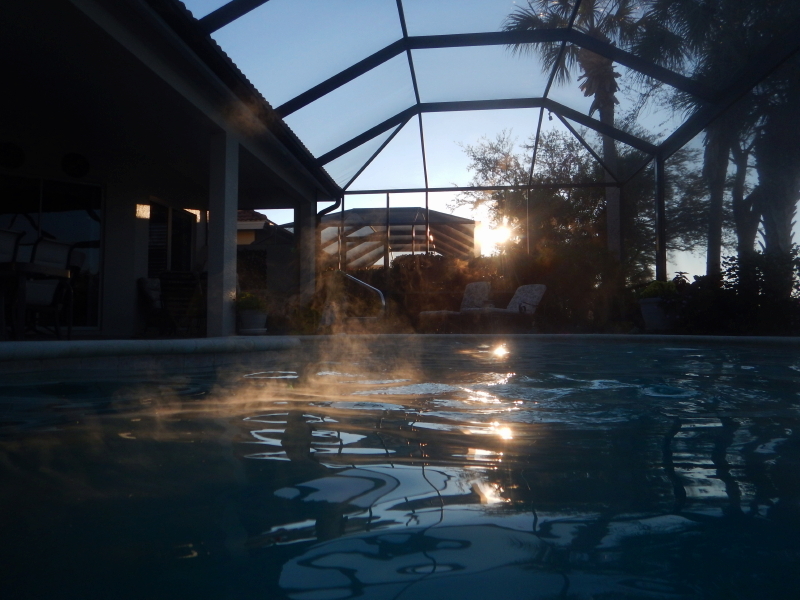 The morning was cold enough that there were wisps of evaporating moisture rising from the heated pool. I enjoyed a swim to start my day, despite temperatures in the 40s (F). 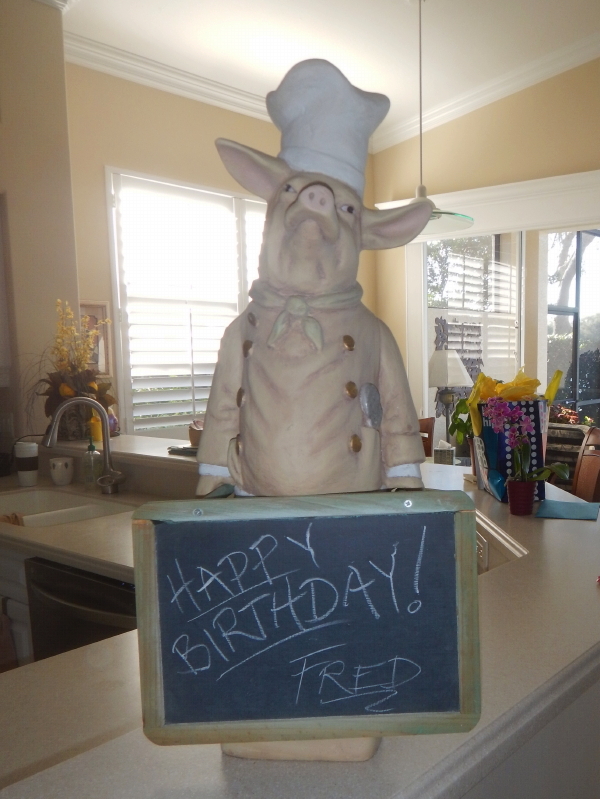 Yesterday was Fred’s actual birthday, so we updated the chalkboard sign in the kitchen. Fred was off braving the chill to get in a round of golf, so the rest of us went on an expedition to visit Farmer Mike’s U-Pick flower and produce operation. 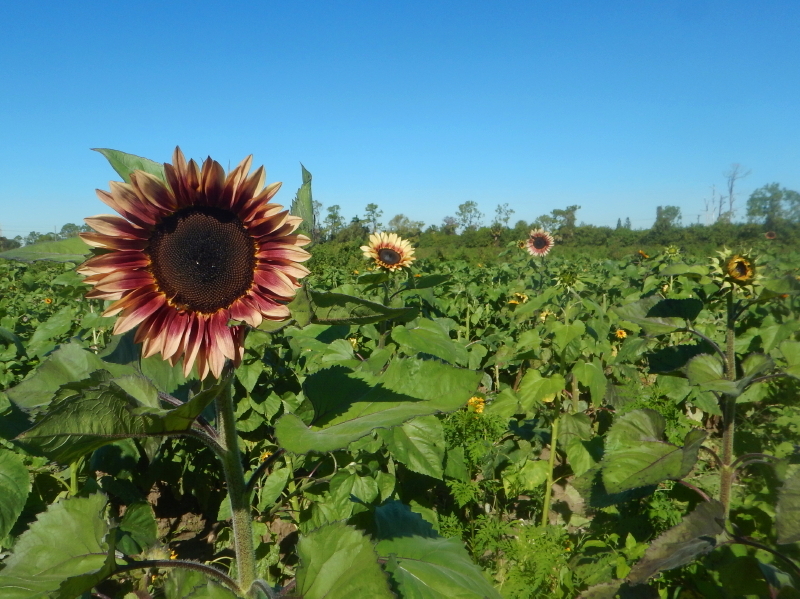 On the way home from the farm, we stopped for some nourishment at Dolly’s Produce Patch and Eatery. 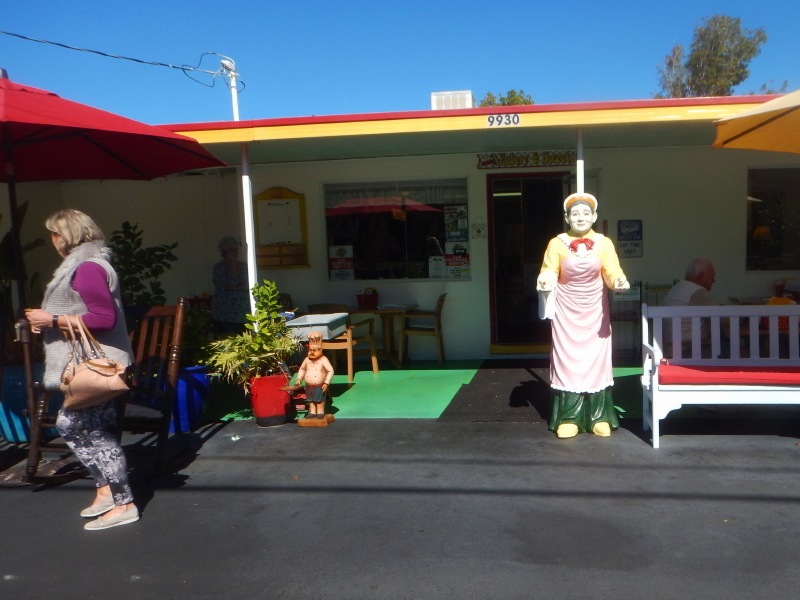 It was a little early for lunch, thus our choices ranged from Blueberry Scone, to a slice of Key Lime Pie, to my cup of freshly homemade Cream of Broccoli Soup. The bulk of the afternoon was filled with reading and a nap in the sun, and then preparing for the grand finale of the day. Birthday dinner for Fred would be at Real Seafood restaurant in Naples. It carried on the theme of divine food. I honestly intended to take a picture, but was so immersed in the experience, taking a picture never crossed my mind. We were extremely well fed in every way. Some very interesting images can be found by looking straight up. 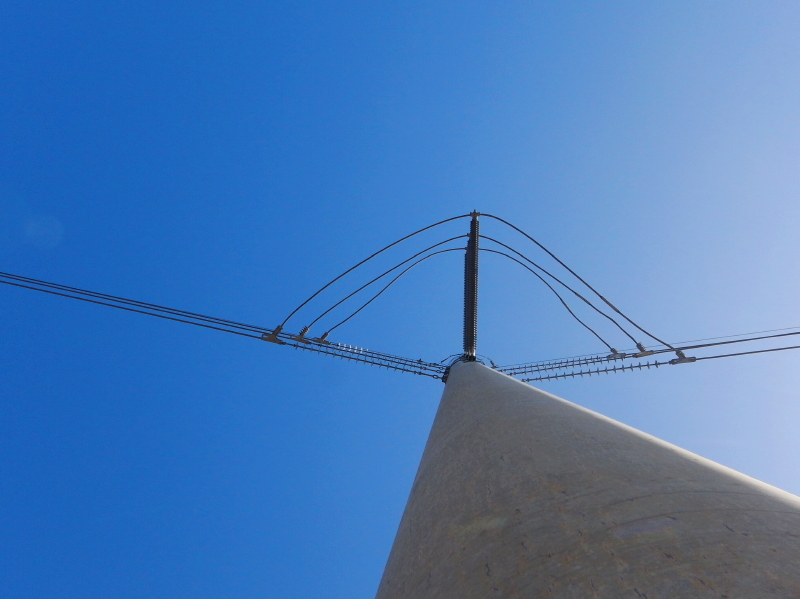 A few days ago, I posted a shot looking up a concrete utility pole in Florida. Here is another version of the same pole, after walking around to the other side. They probably deserve to be shown as a pair. I like the contrast of the opposing direction of the light source between the two. Meanwhile, I’m back at the day-job, digging out from a backlog of work that piled up while I was away. I was so exhausted when I walked in the door after work yesterday, I laid down for a minute. Pequenita immediately took advantage of my presence and pummeled me with kneading and head-butting in a quest for attention. In a blink, I was no longer blinking. My eye lids stayed down and my brain checked out. It just so happened, my labor wasn’t immediately needed outside. For the first time since Cyndie’s knee surgery on the last day of November, she handled the outdoor ranch duties! I think the chance to do some extended walking while we were in Florida, away from the icy, snowy terrain, boosted her confidence. Monday night she walked Delilah while I cleaned up manure and filled hay boxes. Yesterday, she did morning and evening chores, drove to a physical therapy appointment, did exercises there, and then went grocery shopping. Talk about getting back into action. Of course, after dinner it was quickly time to get horizontal for the rest of the night and ice the knee. Fair enough. It feels like I have come out of the tunnel. Things are definitely looking up. Despite some fleeting moments of inclement weather early in the morning (after a really nice little thunderstorm in the middle of the night) our flight home was on-time and without incident. That part about no incidents is a little surprising because of the number of babies and infants on board. I spotted the youngster sitting closest to us was under headphones and being mesmerized by programs on a tablet for much of the 3-hour flight. What a great invention when it comes to really, really wanting a child to be occupied for an extended time. Too bad that advantage gets offset by the greater number of times when parents would like their kids to be present and engaged with others in a moment when they instead choose the oblivion of a tablet. When we landed in Minneapolis, instead of having George and Anneliese pick us up, we took a taxi to Cyndie’s parent’s house in Edina to borrow her mom’s car while mine is in the body shop for repairs. That had us on the road for home at about the same time I would normally be driving home from work on a Monday. That’s one way to quickly put an accent on the fact we are not on vacation any longer. We were met at the door by a very friendly dog who seemed very happy to see us again. Before unpacking a thing, we changed into work clothes and headed out to walk Delilah and tend to the horses. Cyndie decided to put her recent gains in mobility to the test and grabbed ski poles to support her first foray into the snow and uneven ground of our trails. She had done some good walking on multiple surfaces and outdoors while we were in Florida. We made our way to the horses and got right back in the swing of the usual routine. Anneliese made a wonderful dinner, followed by a card game at the table, making us feel completely and warmly welcomed back to our home. Just to get myself fully back into things at Wintervale, I did a little repair work on a problem spot on the electric fence. It was arcing something fierce at the insulator that Legacy had pulled off the t-post. Turns out he cracked it. It was a quick fix of swapping out the bad one with a replacement stolen off a post that wasn’t currently being used. With that task accomplished, I felt like things were well in order after 5-days away. Now we have new snow expected tonight and tomorrow, which will serve as a final punctuation mark to our welcome home. No doubt about it, we are no longer in Florida. 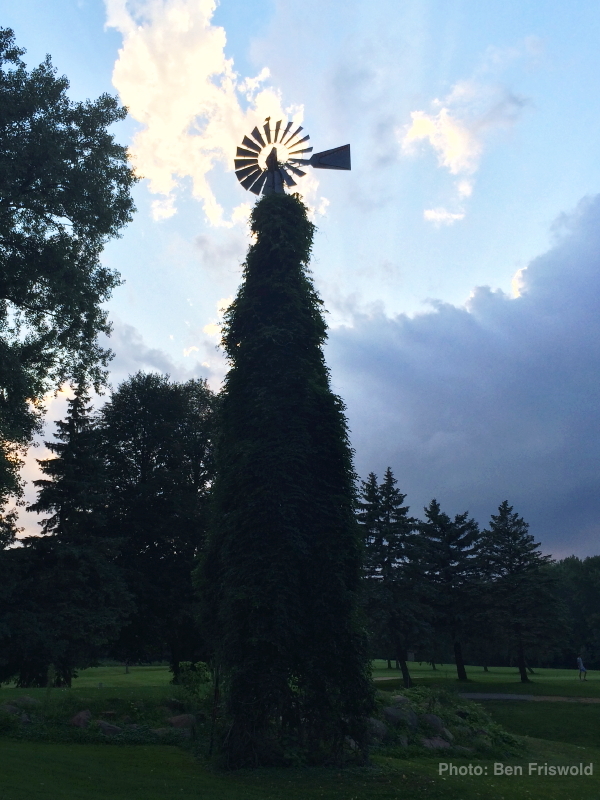 Cyndie’s brother, Ben Friswold, recently sent me some photos he took of the old windmill from Intervale Ranch which is still standing on the Braemar Golf Course in Edina. The course is undergoing some renovations that had us questioning the fate of the precious relic. Both Cyndie and Ben separately contacted the course manager to inquire on their plans and let him know of our interest in preserving it. If they weren’t going to keep the old beast, we wanted to have it. 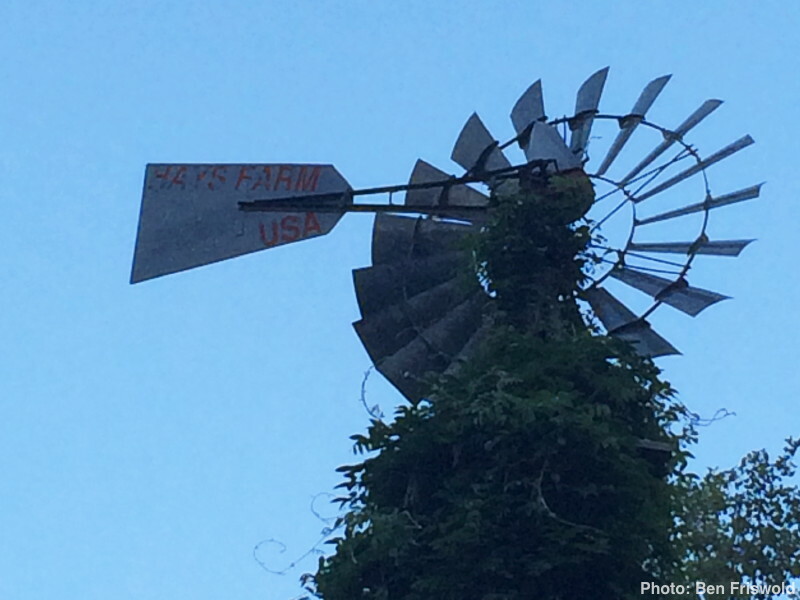 Alas, the response was that they love the history of it and thus included the windmill as part of their new design. I think this is the better place for it, but if they weren’t going to preserve the implement, we would much rather have it than see the metal tossed to a scrap pile. I’m curious about the markings on the tail that say, “Hays Farm USA.” I rather doubt the naming would have been something my father or grandfather would have done. More likely, the city of Edina added that. In most of the historical documents I have reviewed about the property, the city identified it as the Hays Farm, as opposed to Intervale. It has occurred to me that I don’t know if the windmill ever appears in any photos of the Intervale Slideshow I posted a couple of days ago. Wouldn’t that be something if it did. This morning I searched for old posts on Relative Something where I wrote about the farm and discovered I did that back in July of 2009. If you are interested in reading more about the property, check them out. You can find them under the category, “Intervale,” or navigate the “Previous Somethings” back to July 2009. Or, I could provide a link to one of them. More About the Farm seems like a reasonable start. From there you can travel to the ‘previous’ or ‘next’ post on the subject by clicking the links just above the comment box at the bottom of the page. Many thanks to my golfing brother-in-law, Ben, for keeping an eye on our treasured landmark, and providing the pictures used here! After trying to get permission to use copyrighted music prior to publicly posting my slideshow of the old farm property that my grandfather owned, Intervale Ranch, I have decided to accept the default automated claim that kicked in after I uploaded the video to YouTube over 10-months ago. I’m not allowed to monetize the video, which I never intended to do, and YouTube or the music license holder or both —I don’t know which— will be able to place ads on the video. I hope I am correct that those will be the ones that viewers can click to remove as the video plays. So, last evening, I changed the video from private to public. Feel free to kick off the rush that will send this gem viral. Might as well give the license holders their money’s worth. Without further delay, I present, The Intervale Ranch Slideshow. Question and answer session to follow. I invite those with inquisitive minds to post any questions the slideshow engenders by posting a comment to this post. I may use them to write a follow-up post that will fill out the detail glossed over by the sometimes cryptic collection of images. 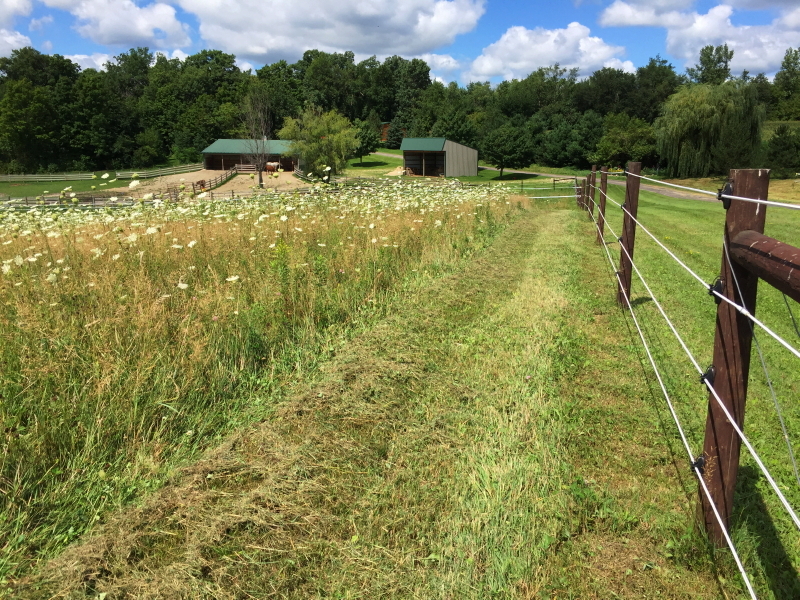 It took twice as long as I expected to finish cutting down the 4 acres we call our hay-field yesterday, but I was trying to do a very thorough job of removing the primary invader, Queen Anne’s Lace from sight. The biennial crop is the most visible evidence that we aren’t growing high quality grass hay out there yet. There is some grass there, and it has become obvious to us from the regular mowing we have done around the labyrinth and along the fence lines, that doing so will help the grasses and hurt the weeds. Right now, we are thinking about just keeping this mowed short for a full year. We may have some additives applied to the soil, and add desireable grass seed over the top, before getting back to baling it again the year after. The project was almost over before I had even completed the first pass along the fence line. For no apparent reason the shear bolt suddenly gave out and the blades stopped cutting. 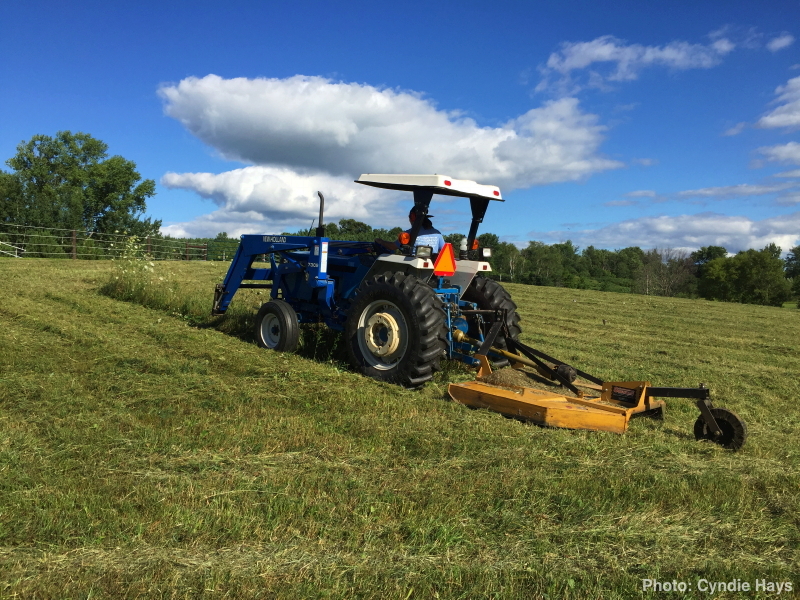 We had waited the entire summer to have this field cut, and when it didn’t happen any other way, we decided to finally just chop it down ourselves. This interruption had me wondering if maybe we were making the wrong decision, but I had a replacement bolt and it was an easy fix, so I didn’t let that problem stop me for long. When it became clear that it was going to take all afternoon to complete the task, Cyndie was kind enough to bring me lunch in the field. It felt just like farming! When I got to the last little strip to be mowed, I wanted to include Cyndie in the moment of achievement. She was serving the horses their evening feed at the barn, so I whistled to get her attention as I was lining the tractor up for the final cut. She heard the second of my shrill chirrups, and was looking to ascertain whether I was in need of her assistance while I was backing into position. 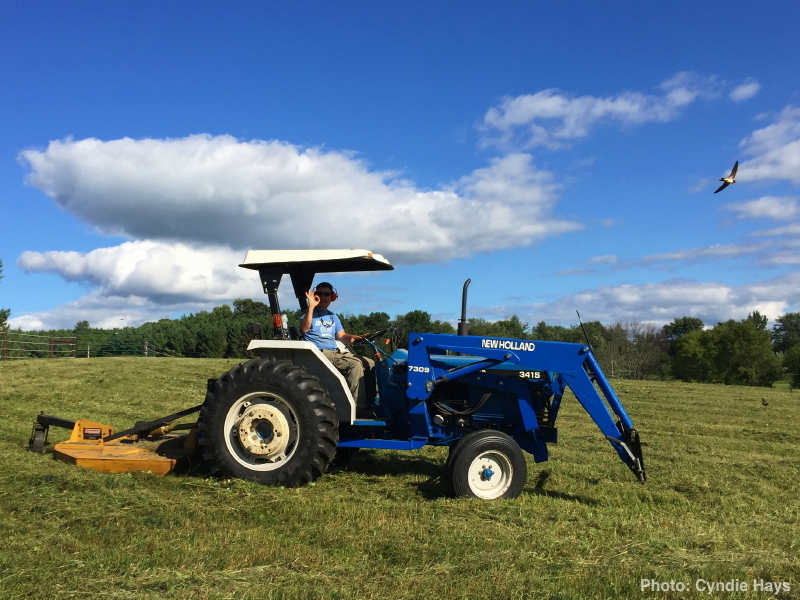 I was intending to point out that it would be the last pass and I just wanted her to share in the joy of accomplishment, when the blades of the mower started clattering on a rock I hadn’t noticed. 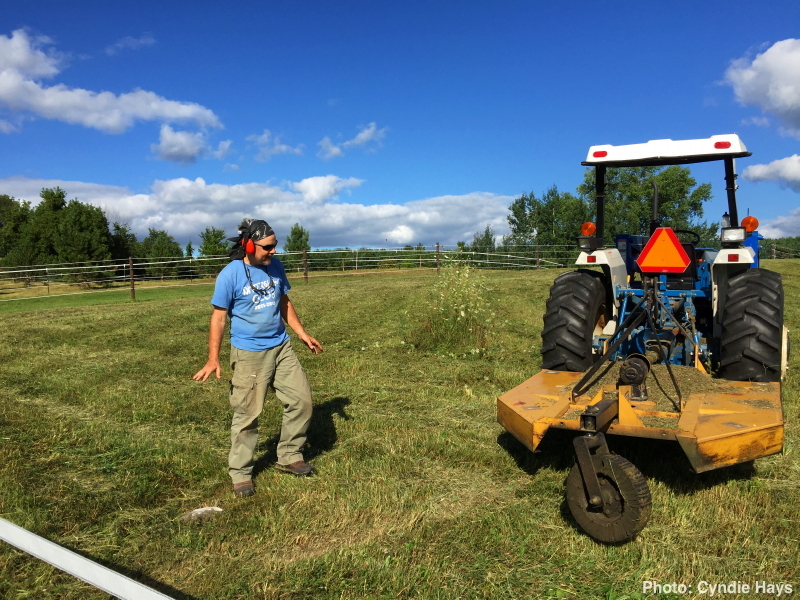 The sound of mower blades hitting obstacles always tends to create a panic response. I stomped on the clutch and lifted the mower. My big moment of victory was dashed by a dose of humble pie. In a comical turn, now she did think something was wrong. She hollered something to me, but I couldn’t hear her words over the rat-tat-tat of the diesel engine idling. After several fruitless tries, we walked toward each other until I heard she was asking if I had my camera with me so she could capture the moment. We laughed over the fact I hadn’t hit a single thing all day, but just as I was hoping to get her attention, …clank. I had already mowed over that rock without incident in the other direction. Backing across it on the slope was a different story. She took the pictures of my final successful pass. Did you see that bird she captured in the last shot? It looks as happy as me over having our field freshly cut. I’ve got a lot of ideas running through my head for projects we are currently considering. I’m contemplating a variety of ways we could add a shade sail in the back pasture for the horses on hot sunny days, for weather that will hopefully be arriving to our region soon. Once again, we are thinking about ways we could teach Delilah to live with free roaming chickens on our property. We really want to add the birds as a natural predator to the unwanted flies and ticks around here. 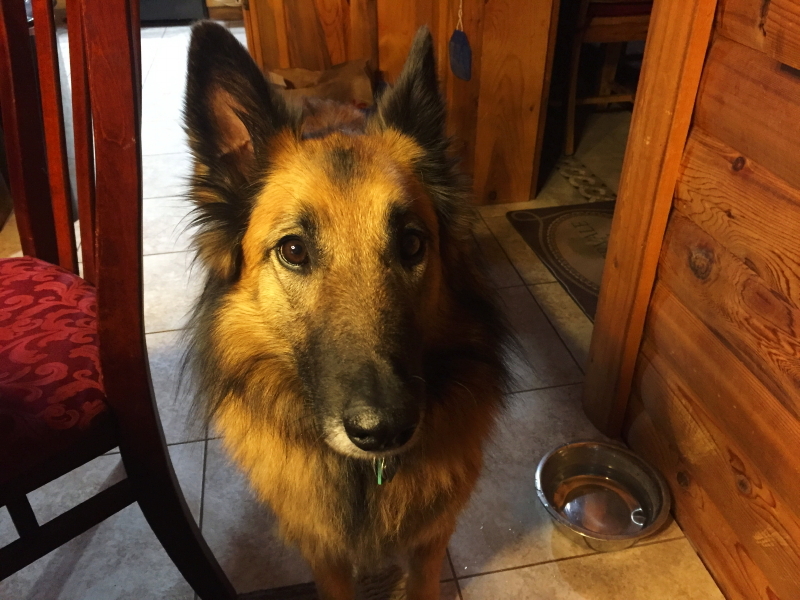 This leads to several issues to be sorted out, like what we would do for a chicken coop, and will we finally get a shock collar to assist with dog training. We are surrounded by so many people for whom these issues are old hat. It serves as both an inspiration and a frustration. It is inspiring to have people with experience answer our queries in ways that make things sound simple and easy. At the same time, my little brain has a tendency to get bogged down with trying to figure out details they seem to gloss over when they are in the mode of simplifying for me. Something tells me I should just take the plunge, and learn by trial and error. There’s a resonance here to the story of us repeatedly not planting asparagus because, every time we talk about it, the fact that it takes years to get established deters us from just doing it. —By the way, we finally did get a couple plants in the ground. Check back with me in a couple of years to see how that turns out for us. Last night we had dinner at George’s and met new friends. It was inspiring and enjoyable. Sadly, George reported he lost a ewe that left an orphaned lamb. Cyndie got excited when he said it would need to be bottle fed. There are no plans for us to be adding sheep in the future. That is not one of the things on my mind.